Thirty years after Chenobyl contaminated up to a quarter of Belarus, the country is building a nuclear plant of its own with Russia’s state nuclear corporation Rosatom, a plant environmentalists and government officials from surrounding countries say has already been plagued by mishaps and secrecy. Over the past three weeks, tentative news reports that a 330-ton reactor vessel fell from a height of 2 to 4 meters on July 10 in Belarus’s Northwest at Ostrovets, the site of the new Belarusian Nuclear Power Plant. Rosatom is the main contractor on the project. The vessel fell during an exercise geared toward installing it the next day in front of the media. Russian and Belarusian nuclear officials kept the incident under wraps for more than two weeks. The apparent coverup was concerning to Nils Bøhmer, Bellona’s executive director and nuclear physicist. The rumors of the mishap were bolstered, according to RFE/RL, when Nikolai Ulasevich, a resident Ostrovets and member of the Belarusian opposition United Civic Party, posted details of the accident on social media on July 25. 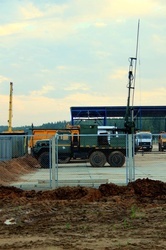 Several news agencies in the Baltic nations, which are fiercely critical of the construction of the plant only 50 kilometers from Lithuania’s capitol of Vilnius, ran reports based largely on Ulasevich’s accounting of the incident on his Russian language Facebook page. 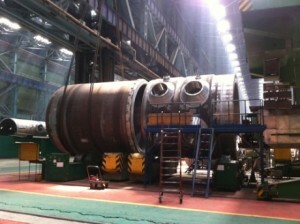 Sixteen days after the incident, on July 26, the Belarusian Energy Ministry finally confirmed the plant experienced an “emergency situation” and posted sketchy accounts on its website in Russian, saying the foul up occurred in a warehouse while the reactor vessel was being moved horizontally. On the same day that Belarusian officials fessed up to the incident, Rosatom claimed there was no damage to the reactor vessel, as reported by the pro-Kremlin Sputnik news agency (in Russian). The corporation said the installation of the vessel should proceed as planned. But on August 2, Rosatom walked back its initial recommendation and offered to replace the dropped reactor vessel with a new one, according to a World Nuclear News report. The same report indicated Mikhail Mikhadyuk, deputy energy minister of Belarus, said questions of what equipment would be used would be taken only after an investigation of the “abnormal incident,” effectively halting for the time being reactor construction as the contentious plant. Citing the Associated Press, WNN quoted Alexander Lokshin, Rosatom’s deputy director general, as saying the vessel “”slipped down slowly and touched the ground softly.” But he added that Rosatom “stands ready” to replace the shell. Mikhadyuk was quoted by WNN on Monday as saying installation of the shell has been suspended. Rosatom subsidiaries OKB Gidropress and Atomstroyexport are inspecting the reactor vessel. The results of the inspection will be sent to the project’s customer – the Belarusian Nuclear Power Plant Company – and to the Nuclear and Radiation Safety Department of the Belarusian Emergencies Ministry, WNN reported. The first Russian designed VVER-1200 reactor at the Ostrovets plant is scheduled to go into operation in November of 2018, and the second unit in July 2020. WNN reported its capacity would be 2340 MWe.